In this new story by Jim Hoft over at the Gateway Pundit that Steve Quayle linked to his website Monday morning Jim reports that a California Senator has introduced a bill to kill free speech, requiring state-sanctioned 'fact checkers' to approve online content, but not just on news websites or blogs but apparently social media posts such as those made on slime-book as well. 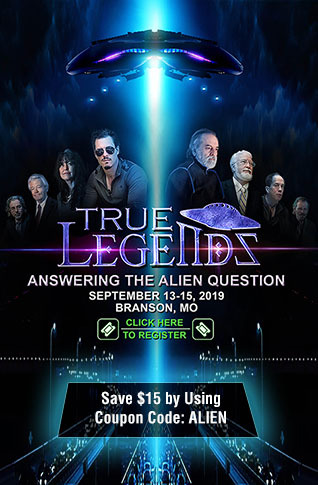 As Jon Rappoport reports in this story over at Infowars, these so-called 'fact checkers' will come from government-supported groups who have already bought into the 'official position' being spewed by 'big brother' hook, line and sinker. As we've reported time and again on ANP, dictators and authoritarian government's across the world are happy to give the penalty of death as the punishment for those who share information that is correct if it is reveals they are corrupt. 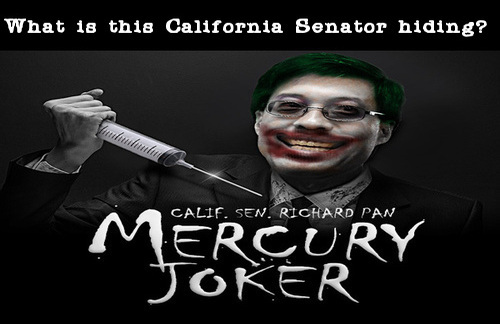 Similar to Hillary Clinton and the left trying to call anything that they don't want Americans to know about them 'fake news', what might California State Senator Richard Pan be hiding that he doesn't want reported by instituting this proposed new California law, or does he simply WANT to be the next Mao Zedong and silence all opposition? This bill would require any person who operates a social media, as defined, Internet Web site with a physical presence in California to develop a strategic plan to verify news stories shared on its Web site. The bill would require the plan to include, among other things, a plan to mitigate the spread of false information through news stories, the utilization of fact-checkers to verify news stories, providing outreach to social media users, and placing a warning on a news story containing false information. (c) As used in this section, “social media” means an electronic service or account, or electronic content, including, but not limited to, videos, still photographs, blogs, video blogs, podcasts, instant and text messages, email, online services or accounts, or Internet Web site profiles or locations..
Did you catch that last one? 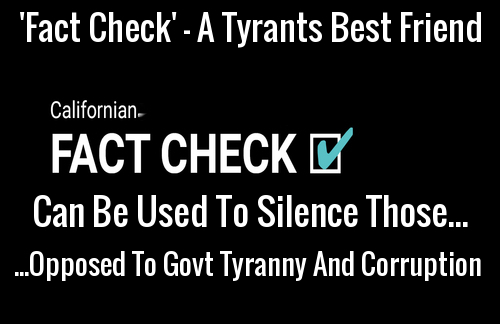 Will fact-check notes soon appear upon text messages and emails, each snooped over by 'official govt censors'? More proof that the state of California has gone full-scale socialist tyranny? And while the tyranny of California might seem half a world away for red-blooded Americans in both red and blue states all across the country who love their freedom and 1st Amendment, twitter CEO Jack Dorsey recently endorsed that his followers read this story over at Medium titled "The Great Lesson of California in America’s New Civil War" within which they claim the last 15 years of California is the 'way forward' for America... tyranny and all. And it's long been said, "where California goes, there goes America"...or so they'd hope. 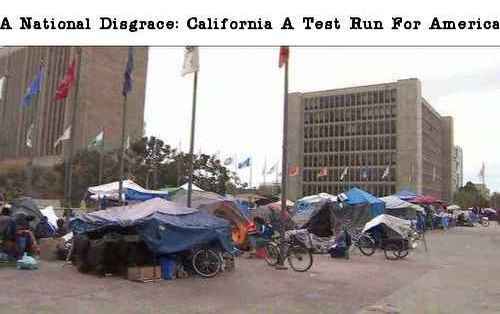 Will all of America soon look like California, which has seen a large portion of their population slipping towards 3rd world nation status, living in tents in numerous areas across the state? 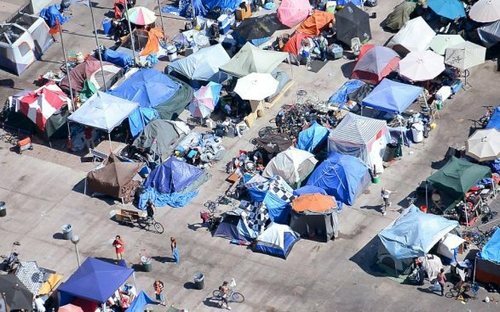 While homelessness and unemployment have skyrocketed, leaving the streets of Los Angeles looking like the streets of Haiti, is this astonishing California bill a last-gasp attempt to 'get ahead' of what should be a tidal wave ripping apart Hollywood corruption which has obviously spread to the state capitol in Sacramento? With Hollywood continuing to prove their hypocrisy by standing against the 2nd Amendment while pushing violence-heavy movies into the world while bizarrely attempting to 'normalize' cannibalism, as Susan Duclos asked in this April 6th story, if California refuses to cooperate with President Trump's National Guard request, should we just 'wall off the state' instead? Even if that long-shot were never to happen, ANP stands all in favor of 'New California' and the state secession movement where conservatives in rural counties are attempting to declare independence from the rest of the state. Recognize the pattern which is repeating in most major cities across the U.S. and the world. Find out why would local politicians pander and cater to a non-citizen population. Recognize how the sanctuary state of California is being used as a political and social wreaking ball against the lawful citizens of the country. For many years there has been a movement by people in northern California and southern Oregon to break away from those states and create the new state of Jefferson. Oregon and Washington are both as leftist-dominated as California, but those states, too, especially away from the coast, have many counties inhabited by normal human beings. Why shouldn’t they be free to defy Moonbeam and his equivalents in Oregon and Washington? Why shouldn’t individual citizens in California defy the state’s unconstitutional gun laws? Why should citizens pay taxes to support aid for illegal aliens and cushy salaries for leftist politicians, judges, and bureaucrats? And why should the idea be limited to California and the West Coast? If Trump betrays us or is overthrown, why shouldn’t Texas secede, or, short of secession, simply refuse to obey many federal laws? Maybe Moonbeam is on to something. Be careful what you wish for, Jerry. NOTE TO ANP READERS: With digital media revenue spiraling downward, especially hitting those in Independent Media, where attacks from every direction continue to come unabated, it has become apparent that traditional advertising simply isn't going to fully cover the costs and expenses for many smaller independent websites. Any extra readers may be able to spare for donations is greatly appreciated.